A library technician is one member of a library's staff. He or she may work in public, academic, school, medical, law, or government agency libraries. Working under the supervision of a librarian, this paraprofessional acquires and organizes materials, lends resources to patrons, and organizes and reshelves items after patrons or users return them. The scope of a library technician's duties varies according to the size of the facility. 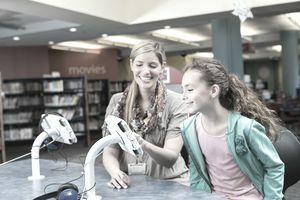 In some libraries, he or she may answer routine questions, teach patrons or users how to use resources, and plan programs. Many also have clerical duties including answering telephones and filing. Library technicians earn a median salary $32,890 annually or $15.81 per hour (2016). This occupation employs approximately 99,000 people (2016). Employers include public, school, university, law, medical, and corporate libraries. About two out of three jobs are part-time positions. Library technicians can expect a good job outlook according to the U.S. Bureau of Labor Statistics. This government agency expects employment to grow about as fast as the average for all occupations between 2016 and 2026. "Provide information service, such as answering questions regarding card catalogs, and assist in the use of bibliographic tools, such as Library of Congress catalog"
"Check books and materials in and out at the circulation desk"
"Maintain student discipline in the library"
"Communicate with a wide variety of patrons by telephone, letter, or electronic means regarding routine and non-routine questions on services to publishers and other specialized library services"
"Process print and non-print library materials to prepare them for inclusion in library collections"
"Maintain and update databases/inventories of documents"
"Remove or repair damaged books or other media"
According to the American Library Association (ALA), training requirements for library technicians range from a high school diploma to a specialized postsecondary training in library technology (Becoming a Library Assistant or Technician. American Library Association). Depending on the postsecondary training you receive, you can earn a certificate or an associate degree. Expect to learn about acquisitions, cataloging, information literacy and research, and public services. The ALA maintains a list of Library Certificate and Degree Programs. Library technicians need excellent computer skills and must keep up with the continuously changing technology used in libraries. Professional associations offer continuing education workshops to help library technicians keep up with new developments in the field. Reading Comprehension: The ability to understand documents in order to organize them properly. Active Listening: This skill will allow you to understand patron's needs and coworkers' instructions. Interpersonal Skills: Strong interpersonal skills will allow you to provide excellent service to patrons and work well with colleagues. "Skill in attending to detail"
"Ability to follow instructions with exactness and work unsupervised"
"Familiarity with Microsoft Office software"
"Able to shelve items on top shelves (which could be up to 80" off ground). Step stools are available"
"Ability to lift/carry/push/pull up to 25 pounds on a regular basis and up to 50 pounds occasionally"
"Able to manage multiple tasks in a fast-paced environment"
"Communicate effectively with clients of varied educational levels and backgrounds sufficient to determine and respond to their informational needs"
Sources: Bureau of Labor Statistics, U.S. Department of Labor, Occupational Outlook Handbook; Employment and Training Administration, U.S. Department of Labor, O*NET Online (visited March 9, 2018).